It isn't too difficult to tell that this is a heron of some kind. Among our herons, the dark wings and back with fine pale spotting only work for juvenile Black-crowned and Yellow-crowned Night-Herons. That was easy enough but telling the two night-herons apart in juvenal plumage is another matter. There are structural differences between the two species, Yellow-crowned being a longer necked and longer legged bird than Black-crowned. The legs of our candidate certainly look long, but the neck is folded so we can't tell how long it might be. Let's take a look at plumage differences. As mentioned before, both species have spotted upperparts in juvenile plumage but on Yellow-crowned Night-Heron this spotting is finer. The streaking on the head and neck of juvenile Yellow-crowned Night-Herons is also finer than the head and neck streaking of juvenile Black-crowned Night-Herons. Our quiz bird has finely spotted upperparts and fine head and neck streaking, making it a Yellow-crowned Night-Heron. 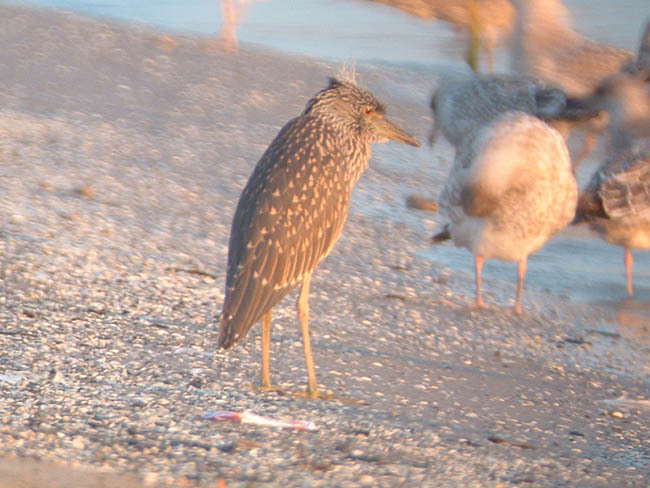 This juvenile Yellow-crowned Night-Heron was photographed at Montrose Beach in Chicago, Illinois on July 17, 2006.